First off, League of Legends consistently tops CS:GO in terms of viewer count, CS:GO will get more viewers when there is a tournament on and there isn’t a LoL tournament on but for the most part LoL has more viewers than CS:GO. Secondly, League of Legends has the LCS tournament and Worlds that are much larger and last longer than CS:GO tournaments bringing in higher prize money and again, more viewers. Even though these are two different games we can still compare them on their structure, growth patterns and overall management. CS:GO is owned by Valve and in terms of tweaking and managing the game they do an okay job. They come out with updates consistently (unlike their past management of the Counter Strike series) and add new content, albeit micro-transaction based. League of Legends is owned by Riot and they do a great job of managing and tweaking their game. 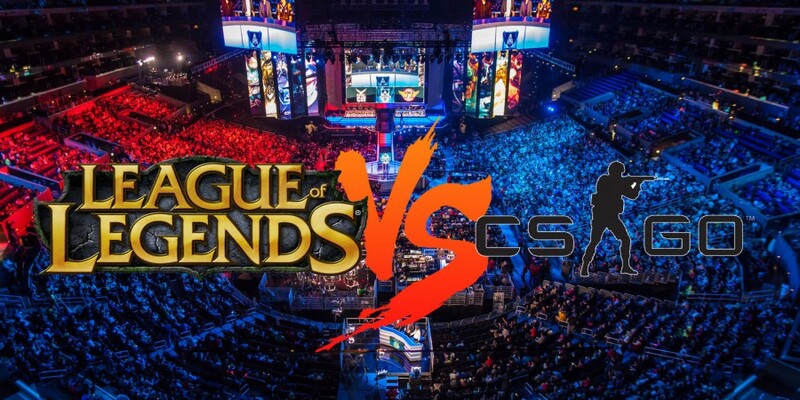 They put on the LCS tournament and The World Series, two major events that have been dubbed the biggest in eSports yet. Again, LoL is updated with additional micro-transaction based content and bugs are fixed regularly. In terms of ‘scandals’ CS:GO has had a lot more than LoL, cheating scandals, match fixing scandals and you generally hear more about people trying to scam or get accounts banned in CS:GO. Everytime this happens CS:GO gets knocked back in terms of it’s growth as an eSport and if Valve wants to make this as big as possible they need to see this and sort it out. Riot rules with an iron fist, they manage, ban and fine players and organisations where necessary. Just this month a LoL organisation and player was fined a significant amount of money, in the thousands, because they tried to poach a player from another team. In CS:GO this happens on a regular basis, and nothing happens. Obviously in terms of cheating it is a lot harder to cheat in LoL than it is in CS:GO, so you don’t see as many scandals as you do in CS:GO. In terms of match fixing you can do this in both and I think that because of the iron fist ruling that Riot have implemented from the get go we see a significantly smaller number in scandals in LoL. The only thing that CS:GO has in operation that is to prevent or punish profesional CS:GO players is VAC. An anticheat that has been proved to be poor against the established and upmarket cheats. Valve needs to realise that the game isn’t going to manage it’s community itself, it’s not going to be a huge, professional sport that it could be without intervention from a large governing body. Riot and Valve need to have a meeting and discuss how to improve, possibly work together and manage a growing sport that has the potential to be as big as some of the more traditional sports. To answer the initial question of why LoL is bigger than CS:GO is the fact that you know 100% no one is cheating, that Riot put on these large tournaments with high production value managed with an iron fist and their close relationship with professional players.